A SpaceX-built spacecraft lifted off Friday onboard the SpaceX’s Falcon 9 rocket to deliver 7,000 pounds of scientific instruments and crew supplies to the International Space Station. 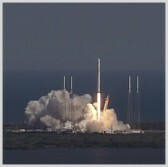 NASA said Saturday the Dragon space vehicle’s launch from Cape Canaveral Air Force Station in Florida marks SpaceX’s eighth cargo delivery mission to the ISS under the Commercial Resupply Services contract with the space agency. Dragon carries the Bigelow Expandable Activity Module and other scientific tools that will be used in Microchannel Diffusion study and experiments on protein crystals. “The cargo will allow investigators to use microgravity conditions to test the viability of expandable space habitats, assess the impact of antibodies on muscle wasting, use protein crystal growth to aid the design of new disease-fighting drugs and investigate how microbes could affect the health of the crew and their equipment over a long duration mission,” said Dava Newman, deputy administrator at NASA. SpaceX’s Dragon is expected to meet the Orbital ATK-made Cygnus spacecraft, which launched March 22 aboard the United Launch Alliance-built Atlas V rocket, for the first time at the orbiting laboratory. The Dragon spacecraft is scheduled to leave for the Pacific Ocean on May 11 with approximately 3,500 pounds of hardware, spacewalking equipment, scientific instruments and biological samples as part of the space agency’s one-year mission. NASA awarded SpaceX and Orbital ATK contract modifications in 2015 in an effort to extend the commercial resupply services contracts that it initially awarded to both firms in 2008. Under the modifications, Dragon and Cygnus space vehicles will each deliver 44,000 pounds of cargo, spare parts and other scientific tools to the ISS in 2017.